Mega-Zyme® / 100 tabs - Nature's Way®. To relieve occasional muscle soreness and discomfort due to overexertion and exercise*, take 2 tablets two to three times a day between meals. To support optimal digestion*, take 2 tablets up to three times a day, before each meal. This product is not intended for children. If pregnant, nursing, or taking any medications, consult a healthcare professional before use. ‡Mega-Zyme contains undiluted pancreatic enzymes which deliver 10x the strength specified by the United States Pharmacopoeia. On the Mega-Zyme® label, what does 10X mean? The designation "X" means "times" – therefore, "10x" means "10 times". 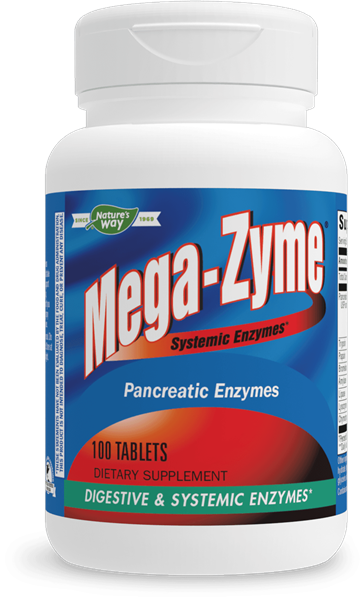 The pancreatic enzymes in Mega-Zyme® are 10 times more potent that the expected minimum activity. The minimum activity was set by the United States Pharmacopoeia, a scientific body which establishes standards for prescription medications and some dietary supplements. Why isn’t the Mega-Zyme® tablet enteric coated?